A lecture given in February 1972 by His Divine Grace A.C. Bhaktivedanta Swami Prabhupada, Founder-Acarya of the International Society for Krishna Consciousness, at an art gallery in Auckland, New Zealand. Ladies and gentlemen, I thank you very much for coming here and giving us a chance to speak about the Supreme Artist. The Vedas describe how great an artist Krsna is: na tasya karyam karanam ca vidyate na tat samas cabhyadhikas ca drsyate. Nobody can be found who is greater than the Supreme Personality of Godhead or equal to Him, and although He is the greatest artist, He doesn’t have to do anything personally. In this world every one of us knows somebody lesser than us, somebody equal to us, and somebody greater than us. That is our experience. However great you may be, you will find somebody equal to you and somebody greater than you. But as far as the Supreme Personality of Godhead is concerned, great sages have concluded by research and experiment that nobody is equal to Him or greater than Him. God is so great that He has nothing to do, no duties He must perform (na tasya karyam karanam ca vidyate). Why? Parasya saktir vividhaiva sruyate: His energies are multifarious and they are working automatically, according to His desire (svabhaviki jnana-bala-kriya ca). Suppose you are an artist. To paint a picture of a very nice rose, you have to take your brush, mix your colors on the palate, and tax your brain to make the picture beautiful. But in a garden you can see not only one rose but many thousands of roses blooming. They have been very artistically “painted” by nature. But we should go deeper into the matter. What is nature? Nature is a working instrument, that’s all—an energy. Without some energy working, how could the rose bloom so beautifully from the bud? There must be some energy working, and that energy is Krsna’s energy. But it acts so subtly and swiftly that we cannot understand how it is working. The material energies seem to be working automatically, but actually there is a brain behind them. When you paint a picture, everyone can see that you are working. Similarly, the “painting” of the actual rose is also worked out by several energies. Don’t think that the rose has been created automatically. No. Nothing is created automatically. The rose is created out of the energies of the Supreme Lord, but these energies are so subtle and so artistic that a nice flower can bloom overnight. So, Krsna is the greatest artist. Nowadays, in the electronic age, a scientist just pushes a button and his machine works so perfectly. Or an airplane pilot simply pushes a button and a huge machine just like a small city flies in the sky. So if it is possible for ordinary men of this world to work so wonderfully simply by pushing some buttons, how much greater must be God’s ability to work. How much more fertile His brain must be than ordinary artists’ or scientists’. Simply by His desire—”Let there be creation!”—everything is immediately manifest. So Krsna is the greatest artist. There is no limit to Krsna’s artistic ability, because Krsna is the seed of all creation (bijam mam sarva-bhutanam). You have all seen a banyan tree. It grows from a small seed. This small seed has so much potency that if you sow it in a fertile place and water it, one day it will become a big banyan tree. Now, what are the potencies, what are the artistic and scientific arrangements within that small seed that allow it to grow into a big banyan tree? Also, on that banyan tree there are many thousands of fruits, and within each fruit there are thousands of seeds, and each seed contains the potency of another tree. So where is the scientist who can create in that way? Where is the artist within this material world who can create a work of art as pleasing as a banyan tree? These inquiries should be made. The first aphorism of the Vedanta-sutra is athato brahma-jijnasa: “In the human form of life one should inquire about the Absolute Truth.” So one should carefully study these questions. You cannot manufacture a machine that automatically grows into a big banyan tree. So don’t you think there must be a big artistic brain, a great scientific brain, behind nature? If you simply say “Nature is working,” that is not a sufficient explanation. But if you are intelligent you will compare the sputnik to the millions and trillions of planets and stars. Just on this tiny earth planet there are so many oceans, so many mountains, so many skyscrapers. But if you go above this planet a few million miles, it will look just like a small spot. You will see it as just a spot in the sky. And there are millions of planets floating in the sky like swabs of cotton. So if we give so much credit to the scientists who have manufactured a sputnik, how much more credit we should give to the person who has manufactured this universal arrangement. This is Krsna consciousness—appreciating the greatest artist, the greatest scientist. Now we are trying to understand the planetary system by our scientific method. But we have not been able to finish studying even the nearest planet, the moon, what to speak of the millions and billions of other planets. But from the Brahma-samhita we get this knowledge: yasya prabha prabhavato jagad-anda-koti-kotisv. By the glaring effulgence emanating from Krsna’s body, innumerable universes are created. We cannot study even one universe, but from the Brahma-samhita we get information that there are innumerable universes and that in each and every universe there are innumerable planets (jagad-anda-koti-kotisv). (Jagad-anda means “universes,” and koti-kotisv means “in innumerable.”) So there are innumerable universes with innumerable suns, innumerable moons, and innumerable planets. All of this is made possible by Krsna’s bodily effulgence, which is called the brahmajyoti. The jnanis, those who are trying to approach the Absolute Truth by mental speculation, by dint of their tiny brain power, can at most approach this brahmajyoti. 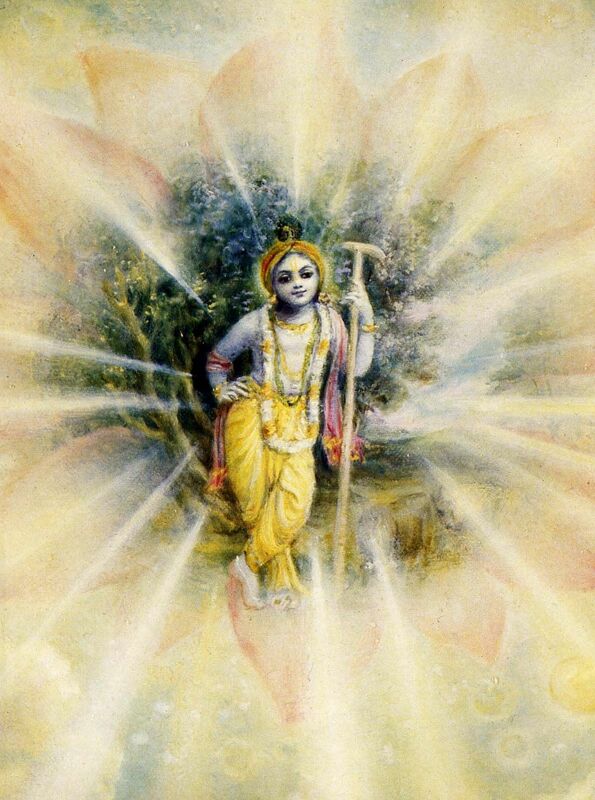 But that brahmajyoti is only the illumination of Krsna’s body. The best analogy is the sunshine. The sunshine is coming from the sun globe. The sun is localized, and the effulgence of the sun, the sunshine, is distributed all over the universe. Just as the moon reflects the sunshine, the sun also reflects the brahmajyoti. And the brahmajyoti is the bodily effulgence of Krsna. So the greatest art is to understand Krsna. That is the greatest art. If we actually want to be an artist, we should try to understand, or try to be intimately associated with, the greatest artist, Krsna. For this purpose we have established the International Society for Krishna Consciousness. The members of this society are trained to see in everything the display of Krsna’s artistic sense. That is Krsna consciousness—to see the artistic hand of Krsna everywhere. In the Bhagavad-gita [10.8] Krsna says, aham sarvasya prabhavo mattah sarvam pravartate: “Whatever you see is an emanation from Me. Everything is created out of My energy.” One should understand this fact—that Krsna is the origin of everything. Lord Brahma confirms this in his Brahma-samhita [5.1]: isvarah paramah krsnah. “Krsna is the Supreme Controller.” Here in this material world we have experience of many controllers. Every one of us is a controller. You are a controller; I am a controller. But above you there is another controller, and above him there is another controller, and so on. You may go on searching out controller after controller, and when you come to the Supreme Controller—He who is not controlled by anyone but who controls everyone else—that is Krsna. This is our definition of God: the Supreme Controller. Nowadays it has become a cheap business to see many “Gods.” But you can test someone to see if he is God. If he is controlled by somebody else, he is not God. Only if He is the Supreme Controller should you accept Him as God. That is the simple test for God. Now, another quality of God is that He is full of pleasure (anandamayo ‘bhyasat). By nature the Supreme Absolute Person is anandamaya, full of pleasure. Suppose you are an artist. You engage in artistic work just to get some pleasure. By painting a picture you enjoy some rasa, some pleasurable mellow. Otherwise, why would you work so hard? There must be some pleasure in painting. So, Krsna is raso vai sah, the reservoir of all pleasurable mellows. He is sac-cid-ananda-vigrahah full of eternity, knowledge, and pleasure. (Ananda means “pleasure.”) His pleasure potency is Srimati Radharani. You have seen pictures of Radha and Krsna. So, Radharani is the manifestation of Krsna’s pleasure potency. As I have already explained, Krsna has innumerable energies, and one of these is His pleasure potency, Radharani. So those who have developed love of God are enjoying transcendental pleasure at every moment by seeing the artistic work of Krsna everywhere. That is the position of a devotee. Therefore we request everyone to become a devotee, to become Krsna conscious, so that you will see the artistic work of Krsna everywhere. Seeing Krsna everywhere is not difficult. For example, suppose you are thirsty and you drink some water. When you drink you feel so much pleasure. And Krsna is the reservoir of all pleasure (raso vai sah). So, that pleasure you feel by drinking water—that is Krsna. Krsna states this in Bhagavad-gita [7.8]: raso ‘ham apsu kaunteya. “I am the taste of water.” For an ordinary person, who cannot fully appreciate Krsna, Krsna is giving the instruction that He is the taste of the water that quenches your thirst. If you simply try to understand that this taste is Krsna, or God, you become God conscious. So it is not very difficult to become Krsna conscious. You simply require a little training. And if you read Bhagavad-gita As It Is—understanding it the way it is stated by Krsna Himself, without any rascaldom or false interpretation—you will become Krsna conscious. And if you become Krsna conscious, your life is successful. You will return to Krsna (tyaktva deham punar janma naiti mam eti). So there is no loss in becoming Krsna conscious, but the gain is very great. Therefore we request all of you to try to become Krsna conscious. Read Bhagavad-gita As It Is; you will find all the information you need to become Krsna conscious. Or, if you don’t want to read Bhagavad-gita, please chant Hare Krsna, Hare Krsna, Krsna Krsna, Hare Hare/ Hare Rama, Hare Rama, Rama Rama, Hare Hare. You will still become Krsna conscious.